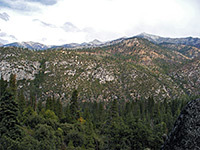 The majority of the vast interior of Kings Canyon National Park is mountainous so trails are in general restricted to the canyon floors. Around Cedar Grove there are many long backcountry routes though day hikes are fewer in number; some are along the Kings River, the others climb the cliffs at the valley sides. The Cedar Grove Map shows the location of each trail. 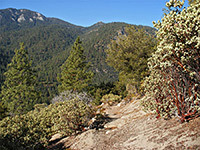 See also the listing of trails for Grant Grove, and the nearby Sequoia National Park. Bubbs Creek 11 4,700 A backpacking route intersecting the John Muir Trail, this trail begins along the path to Mist Falls and follows the wooded valley of Bubbs Creek eastwards all the way to the crest of the Sierras. Don Cecil 6 3,300 Named after a 19th century shepherd, the Don Cecil Trail was once the main access route into Kings Canyon, linking Cedar Grove with a forest track that starts from CA 198 and follows Big Meadow Creek eastwards. From the grove, the trail climbs steeply and continuously to a meadow beneath 8,500 foot Lookout Peak from where a short spur path leads to the summit, a point that provides excellent panoramas over the canyon and the surrounding peaks. 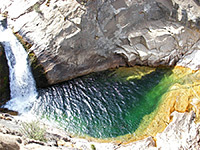 One target for a shorter hike is Sheep Creek Cascade after 1 mile (a 600 foot elevation gain). Hotel Creek/ Cedar Grove Overlook 3 1,500 From the Cedar Grove campground, this trail climbs steeply at first close to the valley of Hotel Creek, then more gently across the hillsides to the west. A spur path leads to the end of a ridge overlooking the grove, while the main route continues north and intersects the Lewis Creek Trail. As the trail climbs the south-facing side of Kings Canyon, it is liable to be in full sun all day. Lewis Creek 6 3,230 Lewis Creek is a lengthy, branched drainage that joins the Kings River 2 miles west of Cedar Grove along CA 180. A trail follows the east side of the creek for a while, climbing steadily through the pine forest, then crosses to the west wide and ends at Frypan Meadow (elevation 7,800 feet) where several other paths branch off, one of which climbs another 2,200 feet to Kennedy Pass on the Monarch Divide, then onwards to even more remote parts of the backcountry. After just 2 miles from CA 180 the Lewis Creek path meets the Hotel Creek trail, allowing for a 6.4 mile loop hike, 1.4 miles of which is along a path parallel to the highway. Mist Falls 4 800 One of Kings Canyon's more spectacular cascades, Mist Falls are reached by a relatively easy trail that starts from the end of the park road and follows the flat valley floor eastwards. River 4.5 240 The River Trail follows close to the south side of the Kings River from Roaring River eastwards, past Zumwalt Meadows and on to the start of the Bubbs Creek trail. Roaring River Falls 0.2 40 This easy, popular, paved path follows Roaring River, a south side tributary of the Kings River, to a 40 foot cascade at the edge of the valley. Meadow 19 5,500 The Simpson Meadow Trail provides a route for backpackers between the South and Middle Forks of the Kings River - a strenuous path with steep climbs for several miles at each end then a lengthy middle section across high basins and mountain passes. 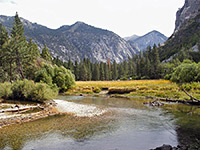 The south trailhead is at Roads End, and while this part of the path has no particular destination suitable for a day hike, the trail quickly gains height and offers excellent views of Kings Canyon almost from the start. One possible target is after 2 miles, where the trail levels out for a while at 7,500 feet, beneath North Dome; the walk to this point involves climbing almost 2,000 feet. Meadows 1.5 (loop) 60 One mile before the end of the scenic drive, the self-guiding loop trail around Zumwalt Meadows has peaceful views of the Kings River, the tall grass meadow, and sheer granite cliffs to the south - rising very steeply to 8,518 foot Grand Sentinel.